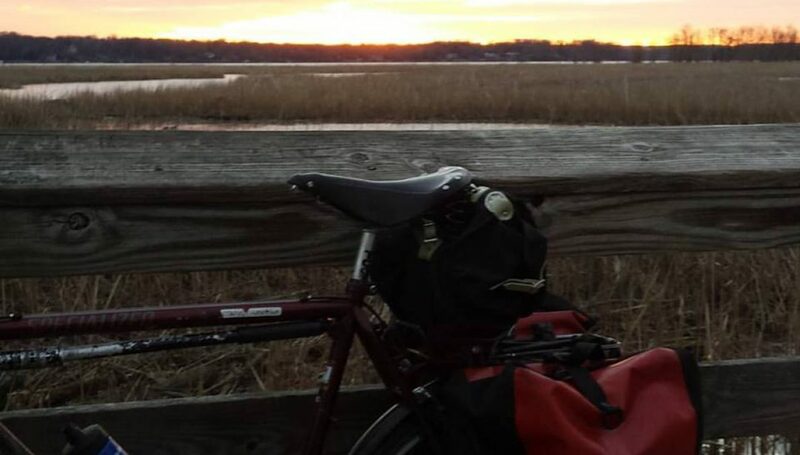 With warm air and a strong tailwind, I rode to DC for my final errand. Along the way, I watched three raptors fighting above the Belle Haven eagle nest. Crazy. It’s Friday and that means Friday Coffee Club. And it’s the season opener for the Washington Nationals. Woot! Observation: When I got to Swings a fire alarm went off. And all the coffee people came outside. I felt like an arriving celebrity. The alarm stopped. I ordered coffee and a muffin and a second alarm went off. So out we went into the wonderfully warm weather. Again. We finally got back inside for good though. The ride home was into that wind that was so kind to me on the way in. Both coming and going I passed the peripatetic Joe Flood who was out searching for cherry blossoms. (He found a few.) I stopped at the gym for Andrea’s secret sauce (weight training). She’s doing a 200K randonnee event tomorrow. Go girl. And so that’s a wrap on my Errandonnee for 2018. Eagles and garage bike races and coffee with friends and physical therapy and Italian subs and gyms and stores. It was fun. Special thanks to Mary for running this crazy event again. Well, it was a nearly nice day here in DC with temperatures in the 50s and light winds. Light rain was the only thing keeping me from celebrating. I rode 29 miles, mostly in the Fort Hunt and Woodlawn areas before finding myself at the gym. After a half hour of weight lifting, I rode home. Lunch was followed by a lame attempt at listening to a podcast. When I awoke it was time to leave for the Crystal City garage bike races. The 11 1/2 mile ride in the rain was not unpleasant. Faint praise, I know. Shortly after arriving at the garage, I had a grilled cheese sandwich with guacamole and jalapenos peppers. I somehow managed to refrain from ordering another. Maybe it was because of the cherry pie I had for desert. Bob “Don’t call me Rachel” Cannon and his wife Elizabeth brought three dogs that were being put up for adoption. One was a mere puppy. I would have taken a picture but it broke the cute-o-meter on my iPhone. After the races I rode home. About halfway there I rode the long wooden bridge on the Mount Vernon Trail behind the Slaters Lane apartment building. As I turned a corner I saw something standing on the railing of the bridge. It was an owl looking right at me. He was over a foot tall and seemed unconcerned with my presence. This one took 23 miles to do. Total miles for the Errrandonnee so far is 127.5.